When it comes to actors who have played James Bond the only one who really has been able to escape the stigma of the role, despite being the best to wear the tuxedo, is Sean Connery. And unlike some of the other men who’ve played Bond it was never because of anything in particular he did afterwards that established his post-Bond credentials. It’s because he was a movie star, not a guy playing a spy, and it shined through in the films he made after he hung it up as Bond. And if you ever wanted to see Connery go and command that movie star presence in a crap film it would be Outland; it’s one of the many bad films he made that somehow gets to be bearable because Connery has such presence. Connery stars as a sheriff in space who uncovers a conspiracy involving drugs in the federal mining colony he patrols. When hired killers are sent to protect their illicit drug business from him, it’s Connery aping Gary Cooper in High Noon as he’s the only who stands between law, order and criminals. Outland is a b-movie, first and foremost, and as such it’s kind of amusing to see Connery sleepwalk through the film and yet be so commanding throughout. This is Connery who, even when he knew a film was crap, had enough presence to make it seem like he didn’t. There’s something to him that’s magnetic; as a space cowboy Connery doesn’t look ridiculous despite the fact that he looks like a low rent mall cop on occasion. Even Paul Blart dressed and looked better than he does in this film and yet Connery just has so much swagger that it winds up being somewhat enjoyable. The problem is that the film apes High Noon in such mass quantities that it can’t find its own rhythm or pace. Peter Hyams seems so motivated to make his own High Noon that he avoids the originality the film has in spades to go with something already done. Outland is b-movie drek that deserves to stay where it came from. Hyams contributes a Commentary Track and the film’s Theatrical Trailer is included. If you’re a Connery aficionado, Outland in Blu-ray does provide a better a/v presentation. But it has nothing extra that already hasn’t been released; if you have it on DVD then you won’t gain anything but improved presentation with this release. 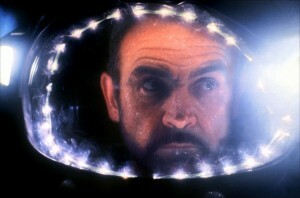 Warner Bros. presents Outland . Written and Directed by Peter Hyams. Starring Sean Connery, Peter Boyle, James B Sikking. Running time: 109 minutes. Rated R. Released: July 10, 2012. Available at Amazon.com.